By now you may have heard of eyelash tinting, a covetable beauty service that involves dyeing your lashes to feign the appearance of a dark, long and lean flutter sans endless tubes of mascara, flakes, mascara tears, falsies, or extensions. Sounds dreamy, right? Plus, in addition to the eyelash tinting services available at certain salons and spas, there are numerous at-home eyelash tinting kits available to buy on marketplace sites like Amazon. But we've been wondering, are eyelash tinting kits safe to use on our own? Like many kinds of beauty treatments, eyelash tinting does run the potential for risk (just because dye so close to the delicate eye area has raised some eyebrows in terms of health and safety), and in some states like California, the professional practice has even been outlawed due to such concerns as damage and injury to the eye. Interestingly, however, other states like New York still allow it. So to gain some expert intel on the topic, we asked Josh Beeler, a Brooklyn-based brow and lash expert at Shen Beauty, to weigh in. Keep reading to find out whether or not eyelash tinting kits are safe and a few other important tips and tricks from Beeler. First, let's talk benefits because according to Beeler (and a handful of our lash-blessed editors) there are many. "I think eyelash tinting is an amazing service. If you’re running to yoga or the gym, taking the kids to school or having a beach day, tinted lashes will help you feel like you have makeup on but leave out the potential for streaks, flakes, or running mascara," Beeler shares right off the bat. Similar to eyelash extensions (though tinting requires even less maintenance), the grand appeal is really an abbreviated morning routine, and ready-set-go lashes that at most may require a quick bend from your eyelash curler and a once-per-month session with your lash specialist for touch-ups and maintenance. "I know that lash tinting recently became outlawed in California," says Beeler. "This is a total bummer because when done correctly, the benefits of eyelash tinting make the monthly visit to your lash specialist worthwhile. Eyelash tinting allows you to easily shave 15 minutes off your morning routine, and if you also get your brows tinted (another amazing service offered at Shen and many other salons), you can achieve that covetable five-minute face so you're out the door in no time." That means more beauty sleep, folks. Two key phrases to note from above: "when done correctly" and "brow specialist." Though eyelash tinting kits are, indeed, available to buy, there are definite risks involved when it comes to administering the treatment on your own—especially if you're completely new to the process. "I don't recommend at-home lash tinting unless it is done by a trained and licensed professional," Beeler warns. In other words, if you're in the market to get your eyelashes tinted and are located in a state where the treatment is legal, definitely do your research. "Something that needs to be addressed is the oxidant or developer that is used with the eyelash tinting kits. For instance, when you have the hair on your head colored, your stylist will probably use around 20 to 30 volume peroxide," Beeler explains. "If you're lightening your hair, the developer can be 40 to 50 volume. This is what lifts the follicle, penetrates it with the color, and makes it permanent. DO NOT EVER use this percentage anywhere around the eye area. At Shen, we use a 3% developer, enough to give the tint longevity but safe to use around the eyes." Though Beeler doesn't recommend using eyelash tinting kits at home (please, just leave it to the professionals), we were still curious to learn what particular eyelash tinting products he personally swears by and feels are the safest to use around the eye. 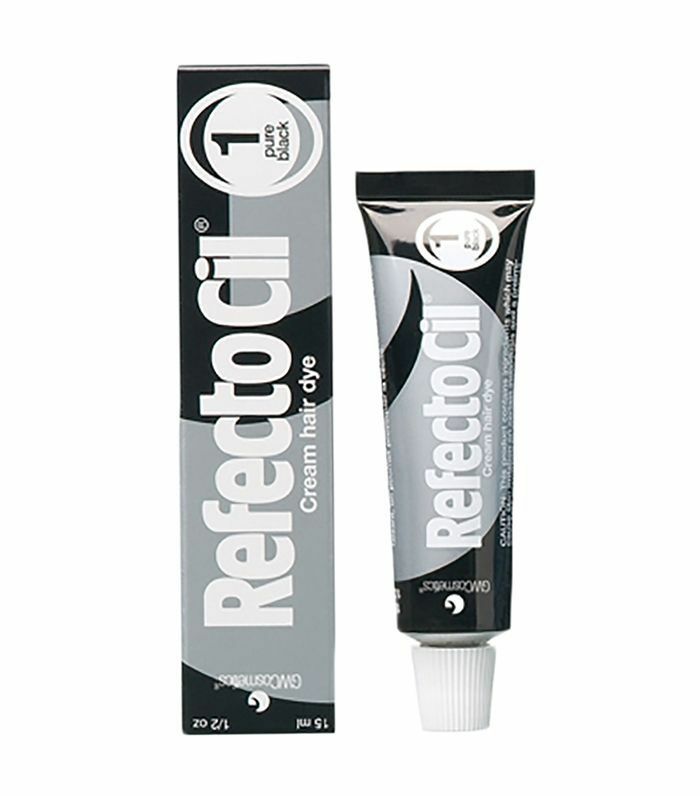 "There's a company called RefectoCil that I use for lash and brow tinting at Shen Beauty. The brand is as natural as you can get with this type of treatment and boasts the full range of colors I need in order to customize the tint. For the most part, when I use this eyelash tinting kit, I'll go with either the black or blue-black or sometimes even a combo of the two. But every now and then, I will use the dark brown shade on a client who has a super-light or platinum shade of hair for a more natural effect," Beeler shares. The takeaway: If you're intrigued and interested in dipping your toe into the world of eyelash tinting, first ensure the practice is legal in the state you're living in and then begin your research—following Beeler's advice to locate a professional who's both trained and licensed. Next, it's not a bad idea to contact the salon or the specialist personally to find out which tinting product they use. Bonus points for a brand like RefectoCil, which gets Beeler's seal of approval. Next up: How to tint your eyebrows at-home. Um, Did You Know You Could PERM Your Eyelashes?